Many dieters have had a fear of carbs shoved down their throats. But while breakfast bagels, donuts and frosted flakes definitely won’t do a body good when trying to lose weight and improve your daily health and energy levels, here’s a delicious little secret you can savor: the best time to consume carbs is in the morning. Carbohydrates are an essential macronutrient. They are your body and brain’s preferred energy source, the most ideal fuel for all physical activities throughout the day. But if you don’t eat the right carbs in the right ways at the right times, they can increase your appetite, spike your blood sugar, overstimulate insulin production, trigger inflammation and disease, and add an enormous amount of unwanted fat to your body. Eating them the right way at the right times, on the other hand, can help you feel fuller faster, balance your blood sugar, improve digestion, fight against inflammation and disease, and lose weight. Your glucose tolerance is typically at its highest first thing in the morning, after your body has been calorie-deprived for several hours during a long night of sleep. That’s why, while eating your entire allotment of daily carbs in one sitting works against you, having a large portion of your daily carb intake with your breakfast is ideal. And by eating complex, high fiber, slow-absorbing carbs with breakfast, you can help trigger fat loss and stimulate good digestion throughout the day, while also cranking up your energy levels and a positive morning mood. A half cup of cooked oatmeal packs 5 grams of metabolism-boosting fiber and 5 grams of protein, with only 150 calories to boot. Oats are a fantastic (and super filling) source of slow-absorbing complex carbs that fuel your body, provide a steady stream of energy and help to decrease the risk of heart disease. For a nutrient-rich filling breakfast, add some fresh berries, cinnamon, seeds and nuts to your morning oats, and pump up the protein (and flavor) power by stirring in a scoop of SLIMQUICK Pure Protein ® French Vanilla or Double Chocolate powder. Throw together this quick and easy Super Oatmeal Power Breakfast in the morning, or let your slow-cooker do the work and wake up to a fresh and ready bowl of yummy Overnight Banana Bread Oats. Not only do these gorgeously colorful and juicy jewels of the fruit world add a fantastic blast of sweetness to your breakfast, but they are also loaded with fiber. 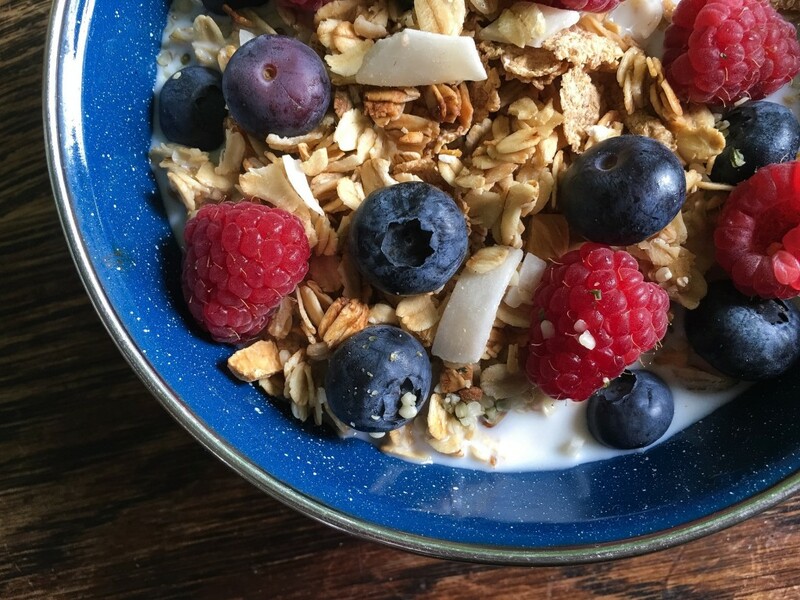 Just a handful of berries like raspberries, blueberries, strawberries or blackberries contain around 8 grams of belly-blasting fiber in each serving, and some of this fiber is a prebiotic kind called pectin, which supports gut health, good digestion, metabolism and immunity. Berries are also a great source of antioxidants, vitamin C, quercetin, copper and vitamin K.
Whirl up this delicious Very Berry Breakfast Smoothie first thing in the morning, and tickle your tongue with these 8 Sweet Recipes featuring Strawberries. Not just a dinner food. One slimming spud packs 25 percent of your body’s recommended intake of bulky belly-friendly fiber, along with 4 grams of protein and 11 times the recommended daily intake of immune-boosting vitamin A, all for a mere 162 calories. If you’re getting your exercise in first thing in the morning (best time! ), than drinking chocolate milk as a pre-workout morning energy drink or as a post-workout recovery drink can significantly improve your gains, says The International Journal of Sport Nutrition and Exercise Metabolism. In one study, subjects who were given chocolate milk to guzzle down before getting on their exercise bikes pedaled harder, rode 49 percent longer and burned more total calories than the subjects who were given carbohydrate-replacement drinks or electrolyte-fortified drinks. Another study showed that the combination of carbs, naturally occurring electrolytes and high protein in chocolate milk made it the ideal recovery drink after a workout, rehydrating the body while stimulating more muscle growth. Yes! You can still eat bread! The sprouted kind. Sprouted whole grain breads like Ezekiel bread are more fiber-packed and nutrient-dense because the whole grains, seeds and legumes used in them were in the process of germinating and sprouting out of their shells – when the plants are at their nutrient-rich peaks – when coming into contact with water. These slow-carb breads also tend to be minimally processed, higher in fiber and protein, have no added sugars, contain no additives, lower in gluten, easier to digest, and far more satiating and filling than regular bread. Use sprouted whole grain bread to make these 6 varieties of Belly-Friendly Breakfast Toasts. Quinoa is a pleasantly nutty-tasting, gluten-free pseudo-grain, higher in protein than any other grain and used by NASA astronauts in space as the ideal plant food to stay nourished and nutritionally balanced. Switch things up in the a.m. by having a bowl of quinoa instead of your usual oats, or try these yum Quinoa Breakfast Squares.